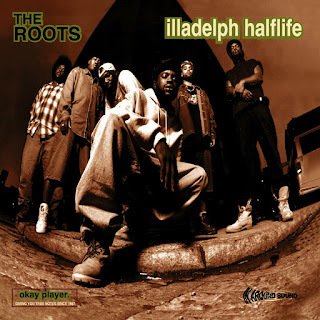 © 1996 DGC/MCA/Geffen Records, Inc.
For the Roots' second major-label album, the band apparently recognized the weaknesses of the debut, since there are several songs which provide more structure than previous jam-session efforts -- two even became R&B radio hits. But for all its successes, Illadelph Halflife mostly repeats the long-winded jams and loose improvisatory feel that characterized Do You Want More?!!!??!. And while these songs may sound great live (a field where the Roots excel over any other rap act), in a living-room setting listeners need hooks on which to focus.